Deferoxamine mesylate USP is a white to off-white powder. It is freely soluble in water and slightly soluble in methanol. Its molecular weight is 656.79. Deferoxamine mesylate chelates iron by forming a stable complex that prevents the iron from entering into further chemical reactions. It readily chelates iron from ferritin and hemosiderin but not readily from transferrin; it does not combine with the iron from cytochromes and hemoglobin. Deferoxamine mesylate does not cause any demonstrable increase in the excretion of electrolytes or trace metals. Theoretically, 100 parts by weight of deferoxamine mesylate is capable of binding approximately 8.5 parts by weight of ferric iron. Deferoxamine mesylate is metabolized principally by plasma enzymes, but the pathways have not yet been defined. The chelate is readily soluble in water and passes easily through the kidney, giving the urine a characteristic reddish color. Some is also excreted in the feces via the bile. Deferoxamine Mesylate for Injection, USP is indicated for the treatment of acute iron intoxication and of chronic iron overload due to transfusion-dependent anemias. 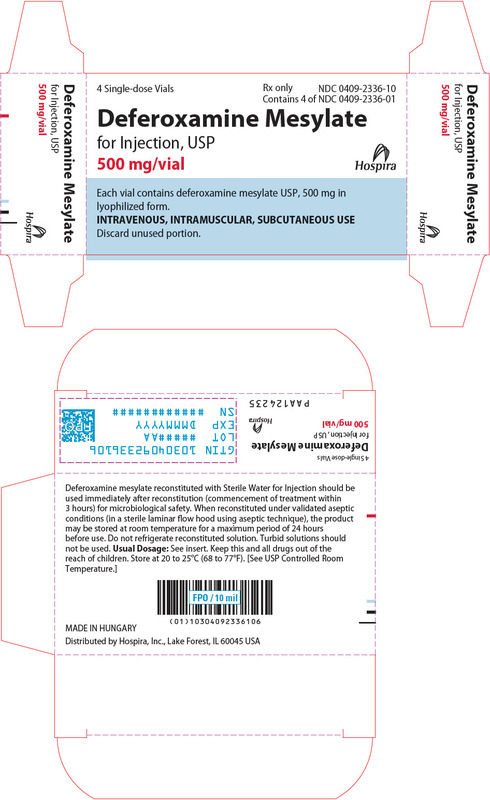 Deferoxamine mesylate is an adjunct to, and not a substitute for, standard measures used in treating acute iron intoxication, which may include the following: induction of emesis with syrup of ipecac; gastric lavage; suction and maintenance of a clear airway; control of shock with intravenous fluids, blood, oxygen, and vasopressors; and correction of acidosis. Deferoxamine mesylate can promote iron excretion in patients with secondary iron overload from multiple transfusions (as may occur in the treatment of some chronic anemias, including thalassemia). Long-term therapy with deferoxamine mesylate slows accumulation of hepatic iron and retards or eliminates progression of hepatic fibrosis. Iron mobilization with deferoxamine mesylate is relatively poor in patients under the age of 3 years with relatively little iron overload. The drug should ordinarily not be given to such patients unless significant iron mobilization (e.g., 1 mg or more of iron per day) can be demonstrated. Deferoxamine mesylate is not indicated for the treatment of primary hemochromatosis, since phlebotomy is the method of choice for removing excess iron in this disorder. Known hypersensitivity to the active substance. Deferoxamine mesylate is contraindicated in patients with severe renal disease or anuria, since the drug and the iron chelate are excreted primarily by the kidney (see WARNINGS). Ocular and auditory disturbances have been reported when deferoxamine mesylate was administered over prolonged periods of time, at high doses, or in patients with low ferritin levels. The ocular disturbances observed have been blurring of vision; cataracts after prolonged administration in chronic iron overload; decreased visual acuity including visual loss, visual defects, scotoma; impaired peripheral, color, and night vision; optic neuritis, cataracts, corneal opacities, and retinal pigmentary abnormalities. The auditory abnormalities reported have been tinnitus and hearing loss including high frequency sensorineural hearing loss. In most cases, both ocular and auditory disturbances were reversible upon immediate cessation of treatment (see PRECAUTIONS/Information for Patients and ADVERSE REACTIONS/Special Senses). Visual acuity tests, slit-lamp examinations, funduscopy and audiometry are recommended periodically in patients treated for prolonged periods of time. Toxicity is more likely to be reversed if symptoms or test abnormalities are detected early. Increases in serum creatinine (possibly dose-related), acute renal failure and renal tubular disorders, associated with the administration of deferoxamine, have been reported in postmarketing experience (see ADVERSE REACTIONS). Monitor patients for changes in renal function. High doses of deferoxamine mesylate and concomitant low ferritin levels have also been associated with growth retardation. After reduction of deferoxamine mesylate dose, growth velocity may partially resume to pre-treatment rates (see PRECAUTIONS/Pediatric Use). Adult respiratory distress syndrome, also reported in children, has been described following treatment with excessively high intravenous doses of deferoxamine mesylate in patients with acute iron intoxication or thalassemia. Flushing of the skin, urticaria, hypotension, and shock has occurred in a few patients when deferoxamine mesylate was administered by rapid intravenous injection. THEREFORE, DEFEROXAMINE MESYLATE SHOULD BE GIVEN INTRAMUSCULARLY OR BY SLOW SUBCUTANEOUS OR INTRAVENOUS INFUSION. Iron overload increases susceptibility of patients to Yersinia enterocolitica and Yersinia pseudotuberculosis infections. In some rare cases, treatment with deferoxamine mesylate has enhanced this susceptibility, resulting in generalized infections by providing these bacteria with a siderophore otherwise missing. In such cases, deferoxamine mesylate treatment should be discontinued until the infection is resolved. In patients receiving deferoxamine mesylate, rare cases of mucormycosis, some with a fatal outcome, have been reported. If any of the suspected signs or symptoms occur, deferoxamine mesylate should be discontinued, mycological tests carried out and appropriate treatment instituted immediately. • Vitamin C supplements should not be given to patients with cardiac failure. • Start supplemental vitamin C only after an initial month of regular treatment with deferoxamine mesylate. • Give vitamin C only if the patient is receiving deferoxamine mesylate regularly, ideally soon after setting up the infusion pump. • Do not exceed a daily vitamin C dose of 200 mg in adults, given in divided doses. • Clinical monitoring of cardiac function is advisable during such combined therapy. In patients with aluminum-related encephalopathy and receiving dialysis, deferoxamine mesylate may cause neurological dysfunction (seizures), possibly due to an acute increase in circulating aluminum (see ADVERSE REACTIONS). Deferoxamine mesylate may precipitate the onset of dialysis dementia. Treatment with deferoxamine mesylate in the presence of aluminum overload may result in decreased serum calcium and aggravation of hyperparathyroidism. Vitamin C: Patients with iron overload usually become vitamin C deficient, probably because iron oxidizes the vitamin. As an adjuvant to iron chelation therapy, vitamin C in doses up to 200 mg for adults may be given in divided doses, starting after an initial month of regular treatment with deferoxamine mesylate (see PRECAUTIONS). Vitamin C increases availability of iron for chelation. In general, 50 mg daily suffices for children under 10 years old and 100 mg daily for older children. Larger doses of vitamin C fail to produce any additional increase in excretion of iron complex. Prochlorperazine: Concurrent treatment with deferoxamine mesylate and prochlorperazine, a phenothiazine derivative, may lead to temporary impairment of consciousness. Gallium-67: Imaging results may be distorted because of the rapid urinary excretion of deferoxamine mesylate-bound gallium-67. Discontinuation of deferoxamine mesylate 48 hours prior to scintigraphy is advisable. Patients experiencing dizziness or other nervous system disturbances, or impairment of vision or hearing, should refrain from driving or operating potentially hazardous machines (see ADVERSE REACTIONS). Patients should be informed that occasionally their urine may show a reddish discoloration. Long-term carcinogenicity studies in animals have not been performed with deferoxamine mesylate. Cytotoxicity may occur, since deferoxamine mesylate has been shown to inhibit DNA synthesis in vitro. Delayed ossification in mice and skeletal anomalies in rabbits were observed after deferoxamine mesylate was administered in daily doses up to 4.5 times the maximum daily human dose. No adverse effects were observed in similar studies in rats. There are no adequate and well-controlled studies in pregnant women. Deferoxamine mesylate should be used during pregnancy only if the potential benefit justifies the potential risk to the fetus. It is not known whether this drug is excreted in human milk. Because many drugs are excreted in human milk, caution should be exercised when deferoxamine mesylate is administered to a nursing woman. Pediatric patients receiving deferoxamine mesylate should be monitored for body weight and growth every 3 months. Safety and effectiveness in pediatric patients under the age of 3 years have not been established (see INDICATIONS AND USAGE, WARNINGS, PRECAUTIONS/Drug Interactions/Vitamin C, and ADVERSE REACTIONS). Clinical Studies of deferoxamine mesylate did not include sufficient numbers of subjects aged 65 years and over to determine whether they respond differently from the younger subjects. Postmarketing reports suggest a possible trend for an increased risk of eye disorders in the geriatric population, specifically the occurrence of color blindness, maculopathy, and scotoma. However, it is unclear if these eye disorders were dose related. Although the number of reports was very small, certain elderly patients may be predisposed to eye disorders when taking deferoxamine mesylate. Postmarketing reports also suggest that there may be an increased risk of deafness and hearing loss in the geriatric population (see ADVERSE REACTIONS). In general, dose selection for an elderly patient should be cautious, usually starting at the low end of the dosing range, reflecting the greater frequency of decreased hepatic, renal, or cardiac function, and of concomitant disease or other drug therapy. No studies have been performed in patients with hepatic impairment. The following adverse reactions have been observed, but there are not enough data to support an estimate of their frequency. At the Injection Site: Localized irritation, pain, burning, swelling, induration, infiltration, pruritus, erythema, wheal formation, eschar, crust, vesicles, local edema. Injection site reactions may be associated with systemic allergic reactions (see Body as a Whole, below). Hypersensitivity Reactions and Systemic Allergic Reactions: Generalized rash, urticaria, anaphylactic reaction with or without shock, angioedema. Body as a Whole: Local injection site reactions may be accompanied by systemic reactions like arthralgia, fever, headache, myalgia, nausea, vomiting, abdominal pain, or asthma. Infections with Yersinia and Mucormycosis have been reported in association with deferoxamine mesylate use (see PRECAUTIONS). Digestive: Abdominal discomfort, diarrhea, nausea, vomiting. Hematologic: Blood dyscrasia (thrombocytopenia, leukopenia). Hepatic: Increased transaminases, hepatic dysfunction. Musculoskeletal: Muscle spasms. Growth retardation and bone changes (e.g., metaphyseal dysplasia) are common in chelated patients given doses above 60 mg/kg, especially those who begin iron chelation in the first three years of life. If doses are kept to 40 mg/kg or below, the risk may be reduced (see WARNINGS, PRECAUTIONS/Pediatric Use). Nervous System: Neurological disturbances including dizziness, peripheral sensory, motor, or mixed neuropathy, paresthesias, seizures; exacerbation or precipitation of aluminum-related dialysis encephalopathy (see PRECAUTIONS/Information for Patients). Special Senses: High-frequency sensorineural hearing loss and/or tinnitus are uncommon if dosage guidelines are not exceeded and if dose is reduced when ferritin levels decline. Visual disturbances are rare if dosage guidelines are not exceeded. These may include decreased acuity, blurred vision, loss of vision, dyschromatopsia, night blindness, visual field defects, scotoma, retinopathy (pigmentary degeneration), optic neuritis, and cataracts (see WARNINGS). Respiratory: Acute respiratory distress syndrome (with dyspnea, cyanosis, and/or interstitial infiltrates) (see WARNINGS). Skin: Very rare generalized rash. Urogenital: Dysuria, acute renal failure, increased serum creatinine and renal tubular disorders (see CONTRAINDICATIONS and WARNINGS). There are postmarketing reports of deferoxamine-associated renal dysfunction, including renal failure. Monitor patients for changes in renal function (e.g., increased serum creatinine). Intravenous LD50s (mg/kg): mice, 287; rats, 329. Inadvertent administration of an overdose or inadvertent intravenous bolus administration/rapid intravenous infusion may be associated with hypotension, tachycardia and gastrointestinal disturbances; acute but transient loss of vision, aphasia, agitation, headache, nausea, pallor, CNS depression including coma, bradycardia and acute renal failure have been reported. Acute respiratory distress syndrome has been reported following treatment with excessively high intravenous doses of Deferoxamine Mesylate for Injection, USP in patients with acute iron intoxication and in patients with thalassemia. There is no specific antidote. Deferoxamine mesylate should be discontinued and appropriate symptomatic measures undertaken. Deferoxamine mesylate is readily dialyzable. This route is preferred and should be used for ALL PATIENTS NOT IN SHOCK. A dose of 1,000 mg should be administered initially. This may be followed by 500 mg every 4 hours for two doses. Depending upon the clinical response, subsequent doses of 500 mg may be administered every 4 to 12 hours. The total amount administered should not exceed 6,000 mg in 24 hours. For reconstitution instructions for intramuscular administration see Table 1. THIS ROUTE SHOULD BE USED ONLY FOR PATIENTS IN A STATE OF CARDIOVASCULAR COLLAPSE AND THEN ONLY BY SLOW INFUSION. THE RATE OF INFUSION SHOULD NOT EXCEED 15 MG/KG/HR FOR THE FIRST 1,000 MG ADMINISTERED. SUBSEQUENT IV DOSING, IF NEEDED, MUST BE AT A SLOWER RATE, NOT TO EXCEED 125 MG/HR. For reconstitution instructions for intravenous administration see Table 2. The reconstituted solution is added to physiologic saline, (e.g., 0.9% sodium chloride, 0.45% sodium chloride), glucose in water, or Ringer's lactate solution. An initial dose of 1,000 mg should be administered at a rate NOT TO EXCEED 15 mg/kg/hr. This may be followed by 500 mg over 4 hours for two doses. Depending upon the clinical response, subsequent doses of 500 mg may be administered over 4 to 12 hours. The total amount administered should not exceed 6,000 mg in 24 hours. As soon as the clinical condition of the patient permits, intravenous administration should be discontinued and the drug should be administered intramuscularly. A daily dose of 1,000 to 2,000 mg (20 to 40 mg/kg/day) should be administered over 8 to 24 hours, utilizing a small portable pump capable of providing continuous mini-infusion. The duration of infusion must be individualized. In some patients, as much iron will be excreted after a short infusion of 8 to 12 hours as with the same dose given over 24 hours. For reconstitution instructions for subcutaneous administration see Table 3. 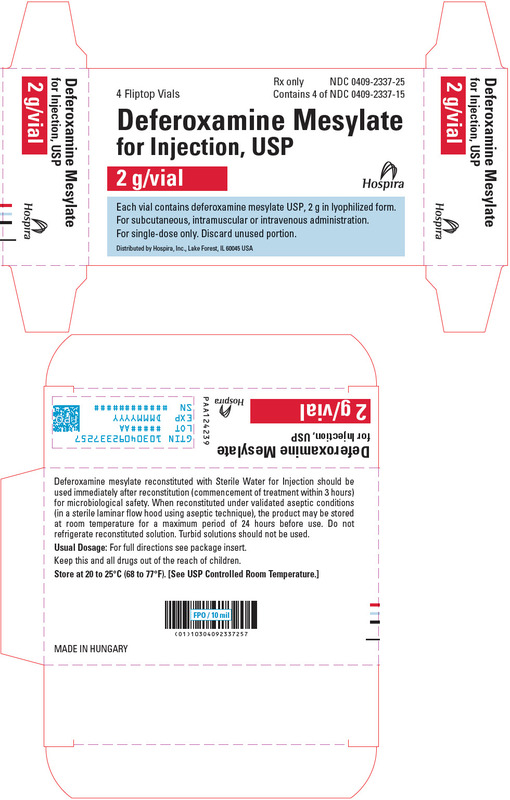 The standard recommended method of Deferoxamine Mesylate for Injection, USP administration is via slow subcutaneous infusion over 8 to 12 hours. In patients with intravenous access, the daily dose of Deferoxamine Mesylate for Injection, USP can be administered intravenously. The standard dose is 20 to 40 mg/kg/day for children and 40 to 50 mg/kg/day over 8 to 12 hours in adults for 5 to 7 days per week. In children, average doses should not exceed 40 mg/kg/day until growth has ceased. In adults, average doses should not exceed 60 mg/kg/day. The intravenous infusion rate should not exceed 15 mg/kg/hour. For reconstitution instructions for intravenous administration see Table 2. In patients who are poorly compliant, Deferoxamine Mesylate for Injection, USP may be administered prior to or following same day blood transfusion (for example 1 gram over 4 hours on the day of transfusion); however, the contribution of this mode of administration to iron balance is limited. Deferoxamine Mesylate for Injection, USP should not be administered concurrently with the blood transfusion as this can lead to errors in interpreting side effects such as rash, anaphylaxis and hypotension. A daily dose of 500 to 1,000 mg may be administered intramuscularly. The total daily dose should not exceed 1,000 mg. For reconstitution instructions for intramuscular administration see Table 1. The reconstituted deferoxamine mesylate solution is an isotonic, clear and colorless to slightly yellowish-colored solution. The drug should be completely dissolved before the solution is withdrawn. Deferoxamine Mesylate for Injection, USP reconstituted with Sterile Water for Injection IS FOR SINGLE-DOSE ONLY. Discard unused portion. The product should be used immediately after reconstitution (commencement of treatment within 3 hours) for microbiological safety. When reconstitution is carried out under validated aseptic conditions (in a sterile laminar flow hood using aseptic technique), the product may be stored at room temperature for a maximum period of 24 hours before use. Do not refrigerate reconstituted solution. Reconstituting Deferoxamine Mesylate for Injection, USP in solvents or under conditions other than indicated may result in precipitation. Turbid solutions should not be used. Each vial contains deferoxamine mesylate USP, 2 g in lyophilized form. For subcutaneous, intramuscular or intravenous administration. For single-dose only. Discard unused portion.